Fantasy sports are booming. But that might come to an end if casinos and state regulators have their way. DraftKings and FanDuel were forced to close their games to Nevada residents last week after the state's Gaming Control Board ruled that daily fantasy sports are the same thing as sports gambling and require a casino license. A.G. Burnett, the board chairman, notes that there are now 40 states with casinos, each with their own gaming regulator. And many have contacted Nevada's board, he said, looking at how to apply gambling and gaming laws in their states to fantasy sports. Fantasy sports is a $1.5 billion industry, but it isn't regulated because federal law specifically exempts it from the federal ban on online gambling. Still, five state banned the industry, even before Nevada effectively shut fantasy sports out of the state. 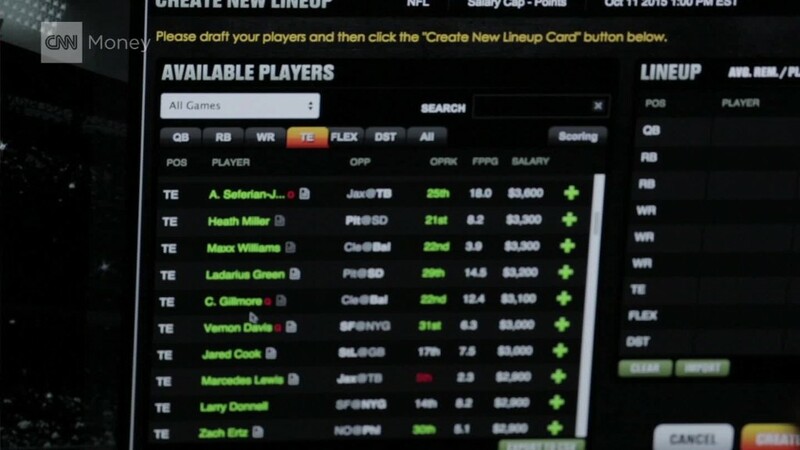 The Illinois Gaming Commission has already said that fantasy sports are under review there. And Pennsylvania lawmakers are set introduce a bill that would require fantasy operators to partner with casinos in that state. "There's no accountability no oversight," said Rep. George Dunbar of Pennsylvania. "It's the wild wild west. This will provide peace of mind to those who are playing fantasy sports." The National Association of Attorneys General met with officials of both the casino and fantasy sports industries in September to talk about what gambling laws should apply to fantasy sports. If enough states crack down on fantasy sports, the industry's explosive growth could come to a screeching halt. Not surprisingly, the fantasy companies aren't happy. "Our growth, and really the actual existence of our company, shouldn't be stifled by the big money gaming lobby," said Emily Bass, spokeswoman for FanDuel. "The casino industry has struggled to grow in recent years, but that doesn't give them the right to stymie the innovation that is coming out of successful young companies like FanDuel." The American Gaming Association, the casino industry trade group, insists it is not trying to shut down the games, but it says it does want the law to be applied equally. "Our industry is a very highly regulated industry and we've been left in the sideline with fantasy sports," said AGA senior vice president Sara Rayme. "We're just seeking legal clarity." But that "clarity" could mean much tougher regulations that could effectively shut fantasy out of many states. "No one likes a patchwork," said Jeremy Kudon, a lobbyist for both DraftKings and FanDuel as well as the fantasy sports trade association. "We are interested in responsible consumer protection legislation that clarifies that the millions who engage in fantasy sports are doing something legal." This push for more regulation comes as fantasy sports struggles with allegations that their own employees were benefiting from inside information when playing the games themselves. The services have denied those allegations, but have since prohibited employees from playing for money.